Rolls-Royce Ghost Interior, Sat Nav, Dashboard | What Car? If nostalgic design underwired by modern technology sounds appealing, then you’ll adore the Ghost’s interior. It’s both classic and opulent, with beautiful pastiche art deco instruments, along with rotary heater controls, bullseye air vents and a thin-rimmed steering wheel that could have been lifted straight from a late 1970s Rolls-Royce Silver Shadow II. Then, of course, there are the highly polished, rich-grained wood veneers and expertly stitched, soft lavalina leathers. 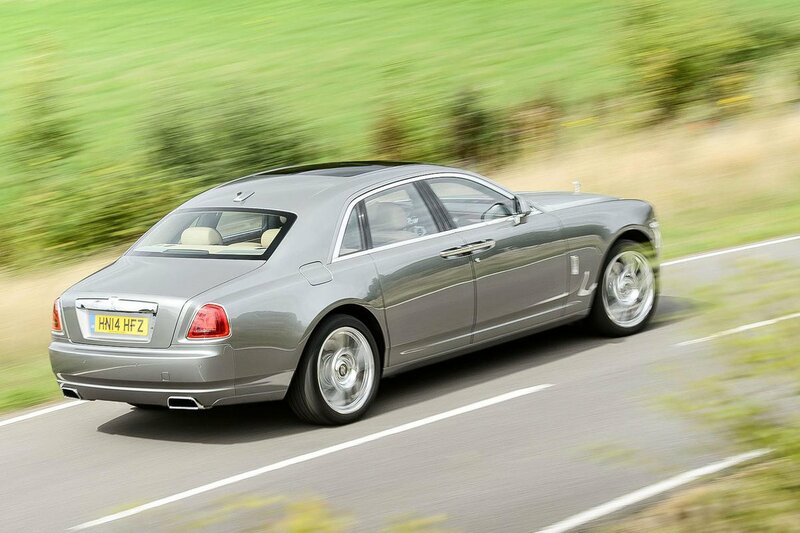 There is nothing in the class, not even the Bentley Flying Spur, that looks as exquisite. However, there are cars – the Flying Spur being one – that possess a little more material integrity when you start prodding. They say all that glitters isn’t gold, and all that’s silver in the Ghost isn’t metal – most of the 'chrome' switches and surfaces are in fact plastic, including those celebrated bullseye vents and the strip of faux-aluminium trim surrounding them on the dashboard. It’s disappointing in a car costing this much. 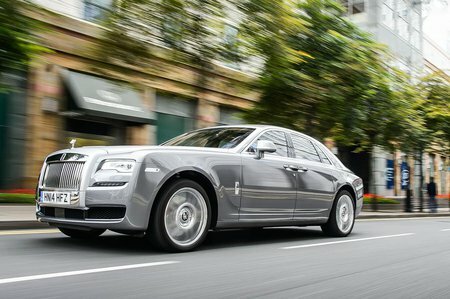 In tight spots, you become acutely aware of the Ghost's size – even the standard wheelbase model – but it is relatively easy to see out of. Plus, you get parking sensors and a reversing camera to help with monitoring its extremities. Part of the reason for the decent visibility is a high-up driving position that’s on a par with many SUVs. And, as well as being elevated, the driver’s seat is arguably one of the most comfortable of any current car; it’s wide, well shaped and softly cushioned like an old chesterfield, but with underlying support over a long journey. Multi-way electrical adjustment makes the seat highly tunable, too. Once ensconced, you’ll find all the buttons easy to reach. The iDrive-based infotainment system, with its rotary controller and shortcut buttons, is slick and easy to operate on the move – more so than the Mercedes-Benz S-Class’s Comand system or the Flying Spur’s touchscreen. When the screen is not required, you can press a button and a retractable slab of veneer drops down to hide it.